Google celebrates 81st birthday of Miriam Makeba, en.wikipedia.org/wiki/Miriam_Makeba nicknamed Mama Africa, who was a Grammy Award-winning South African singer and civil rights activist. Makeba was the first artist from Africa to popularize African music in the U.S. and around the world. Born Zenzile Miriam Makeba, Makeba’s famous song was “Pata Pata,” also a dance that was first released in 1957 and released in the U.S. ten years later. She actively campaigned against the South African system of apartheid. As a result, the South African government revoked her citizenship and right of return in 1959 and was exiled for 30 years. As the apartheid system crumbled she returned home for the first time in 1990. Miriam Makeba was amongst the several popular artists that took part in the Nelson Mandela 70th birthday tribute festival on 11 June 1988. 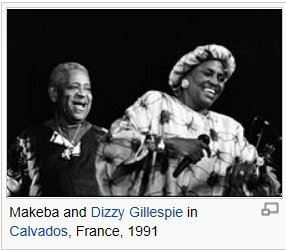 Makeba died after a massive heart attack on 9 November 2008 (at 76 years old) after performing in a concert in Italy organized to support writer Roberto Saviano in his stand against the Camorra, a mafia-like organization local to the region of Campania that murdered Ghanian immigrants. Today, March 4, 2013 Google celebrated Miriam Makeba with an artistic African motif styled doodle. This blog post came about 2 minutes before midnight, but just had to join in and celebrate 200 years since the greatest fairy tales of all time.